We describe a case of macular hole (MH) closure after intravitreal bevacizumab therapy for an underlying pigment epithelial detachment (PED) due to exudative age-related macular degeneration (AMD). The 73-year-old Caucasian female presented with reduced visual acuity (20/80) of the left eye and metamorphopsia for approximately 6 months. 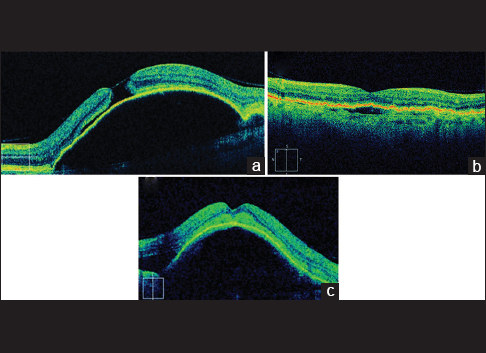 Spectral domain optical coherence tomography revealed a subfoveal PED due to AMD with an associated MH. To treat the exudative component of the pathology, we started intravitreal bevacizumab therapy, consecutively leading to reduction of the height of PED and allowing closure of the MH. Detachment recurred during further follow-up, but the MH remained closed. MHs and exudative AMD are common diseases, which rarely occur simultaneously. To the best of our knowledge (search via PubMed for “MH,” “PED,” “age-related macular degeneration”), no other case with the persistent closure of an MH associated with PED during intravitreal antivascular endothelial growth factor therapy and despite recurrent PED has been published to date. The 73-year-old Caucasian female presented with decreased vision and metamorphopsia for 6 months in her left eye. Initial examination revealed best-corrected visual acuity (BCVA) of 20/80 LE and 20/25 RE. Fundus biomicroscopy showed exudative AMD with subfoveal PED and an associated MH. Spectral domain optical coherence tomography (SD-OCT) confirmed a full-thickness MH with attached edges and a partially detached posterior hyaloid on top of the prominent PED [Figure 1]a. Intravitreal anti-VEGF-therapy with three loading doses of monthly bevacizumab (1.25 mg)-injections was started. Already 4 weeks after, the first injection PED had resolved with an approximation of the MH edges [Figure 1]b, but BCVA decreased to 20/160. Four weeks after, the second injection SD-OCT findings showed complete closure of the MH and marked visual improvement to 20/50. During further follow-up, PED recurred, but no reopening of the MH was observed [Figure 1]c. Continued intravitreal drug therapy with bevacizumab according to Pro Re Nata regimen led to resolution of PED and visual stabilization. MH in the presence of drusen are not rare, and the results of vitreous surgery have been published earlier., In contrast to commonly accepted causative factors such as anteroposterior and tangential vitreous traction forces as in idiopathic MH, intraretinal glial pathology seems to be the prominent cause in secondary holes, such as ruptured cysts in vascular macular edema  or glial apoptosis on top of confluent soft drusen. The successful surgical treatment of MHs associated with PED was reported by Raiji et al. and Cazabon, but no report exists on closure of a PED-associated MH by intravitreal anti-VEGF treatment. However, the formation of MH during intravitreal VEGF treatment in patients with PED  and rip  is already described. The authors proposed vitreous changes, induced by intravitreal injections as a possible pathomechanism. In the presented case, it is not known whether the MH was already existing before AMD changes occurred. If it had developed after PED, stretching forces may have played a crucial role in the formation of the MH. A rate of 8.6% spontaneous closure in idiopathic MHs is reported by Chew et al. It usually occurs after spontaneous posterior vitreous detachment. In the presented patient, in OCT images the posterior hyaloid remained attached, however, tangential vitreous traction forces may have released during intravitreal drug treatment. Therefore, in this case, the resolution of PED during anti-VEGF-therapy seemed to release the mechanical stress allowing approximation of the MH-edges and closure of the hole. Clemens CR, Holz FG, Meyer CH. Macular hole formation in the presence of a pigment epithelial detachment after three consecutive intravitreal antivascular endothelial growth factor injections. J Ocul Pharmacol Ther 2010;26:297-9. Oshima Y, Apte RS, Nakao S, Yoshida S, Ishibashi T. Full thickness macular hole case after intravitreal aflibercept treatment. BMC Ophthalmol 2015;15:30. Berinstein DM, Hassan TS, Williams GA, Margherio RR, Ruby AJ, Garretson BR. Surgical repair of full-thickness idiopathic macular holes associated with significant macular drusen. Ophthalmology 2000;107:2233-9. Chaudhry NA, Flynn HW Jr., Smiddy WE, Thompson JT. Macular hole surgery in the presence of prominent macular drusen. Arch Ophthalmol 2000;118:131-2. Johnson MW. Posterior vitreous detachment: Evolution and role in macular disease. Retina 2012;32 Suppl 2:S174-8. Brüggemann A, Hoerauf H. Atypical macular holes. Klin Monbl Augenheilkd 2008;225:281-5. Raiji VR, Eliott D, Sadda SR. Macular hole overlying pigment epithelial detachment after intravitreal injection with ranibizumab. Retin Cases Brief Rep 2013;7:91-4. Cazabon S. Full-thickness macular hole formation associated with pigment epithelial detachment: Link or coincidence? Int Ophthalmol 2010;30:739-42. Geck U, Pustolla N, Baraki H, Atili A, Feltgen N, Hoerauf H. Posterior vitreous detachment following intravitreal drug injection. Graefes Arch Clin Exp Ophthalmol 2013;251:1691-5. Chew EY, Sperduto RD, Hiller R, Nowroozi L, Seigel D, Yanuzzi LA, et al. Clinical course of macular holes: The Eye Disease Case-Control Study. Arch Ophthalmol 1999;117:242-6.